Blog category Select Category Fan stories For fellow writers Freethought Funny anecdotes News! Personal stuff Short Stories – for free! Star-Fleet.com ~ Best Star Trek online roleplaying game on the Web! Vicki Baum ~ German speaking Austrian best selling author who wrote her books in English! I have always had a thing about personality tests. I grew up in a time without being online, so we read magazines for kids/teenagers, and they always had one such test in each issue. A friend of mine told me she was a INFJ type personality, so I got curious and indeed the Myers Brigg type test is considered one of the most psychologically valid ones, proven to be very accurate. Only in the second category I am fully Intuitive, that’s the ‘N’ (iNtuitive), versus ‘Sensing’. And proud of it. I will NOT EVER be compartmentalized, not consciously, not subconsciously. Above all, I am a Freedom-seeker & -fighter. Take this corporate world! 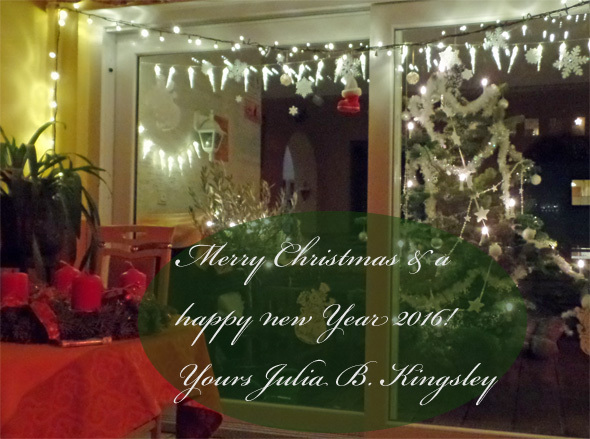 Have a wonderful Christmas time and very happy and joyful Year 2016 in which your dreams come true! Love is the most wonderful thing in this world and at the same time it can likewise hurt. But sometimes the fact that it hurts shows you that it is real. Bittersweet. A door that opens into the unknown, into a new universe full of utter beauty and new worlds, but to get there on your own is impossible, because you need air to breathe or a ship to fly you there. So you stand at the threshold waiting for the ship to pick you up. Waiting in vain. No one can force love. It is as free as a thought…. So you stand there, at the open door, looking into this universe and marvelling upon its utter sheer beauty and your heart breaks because you know you will never be fully part of it, you will never be able to walk on those worlds, touch the soil, breathe the air, immerse yourself in it and explore it. And it hurts. It hurts so friggin bad. Still, in the middle of the pain, you regret nothing. You want the hurt, if it means it opened that door for you, if it means you can see and marvel at this universe. You want the hurt, if it means you can behold this beauty and that, in itself, broadens your horizon, your perception of it, your understanding of depth, of beauty and of love. Yes, even your ability to feel love and to live it. Because you can still love, even if you will never touch the soil of these new worlds. You can still love it and open your heart for it, and be more yourself, true to yourself and true to your heart. Because each time you open your heart to love, no matter in which form or to whom, you become reborn in yourself and you are not the same person anymore than you were before. That is the gift of love, no matter whether it is being returned or not. That is why it is the greatest power in all of the Universes. It creates. Even when it is the kind of love that hurts. It still creates. In the end you are never the same person as before. To know love is to truly live. And that is worth the pain! It was a sweet dream. And it will stay a sweet dream. Thank you, dear Universe. Thank you. Posted: October 6, 2013 in News! – Travel Guide to the Languedoc will be published before Christmas by www.liquid-letters.com as an interactive e-book and in print. The necessary change of publisher postponed the date, but on the plus side – the content has increased with updated pictures and information. – New edition of Flavia’s Christmas Stories for children: Due to the great popularity of the stories last year, there will be a new 2013 edition before Christmas, with all 24 Christmas calendar stories in one book, plus an extra story for the day after Christmas! I am looking forward to keep hearing from you. I promise I will also write more blog posts again, now that the days are growing longer and people have more time and eagerness to read (and write). Sometimes I feel like I’m swimming through life, never quite aware of whether I’m above water or already below, whether I’m floating, paddling, crawling or doing this dolphin stuff, whether I’m in a peaceful lake, in a river swimming up- or downstream or in an ocean in the middle of nowhere or just 5 meters from the beach. All I know that my feet don’t touch the ground and when I stop moving, I’ll drown. I feel compelled to do so many things, but I have no clue if they get me any closer to the land. My land. The land where I belong, where I was meant to be, where everything makes sense, including myself. There are moments where I am floating weightlessly on the warm water, the sun is shining down on me and the full beauty of this Earth is revealed in front of my eyes and I feel totally happy, content and blissful. And I live for those moments. I fight for those moments, I work hard for them, never giving up, never loosing hope, because each time, there is the chance that the current of these moments will gently carry me to my land. Yet, if I was one of those people whose feet have never left the ground, I wouldn’t know this feeling of weightlessness that frees you from the bounds of the world and lets you experience the realm of inspiration, caught in the creativity of my written word. Soon on all major ebook platforms: An Insider’s Travel Guide! Posted: February 21, 2013 in News! Since “The Fenris Clan”, my time travel thriller, is now finished and going through the editing process, I have used the available time to write an Insider’s Travel Guide. “The Beauty and Mystery of the Languedoc” (Southern France). It will be published this year on all major ebook platforms. If you’ve ever dreamt of going on a very special holiday in Europe, that offers much more than just the usual tourist sightseeing attractions, where the first thing you have to do is to line up, then this is for you! This guide will offer much more than the standard A, B, C…. generic stuff. It will feature entertaining short stories about this amazing place, real insider info and background stories and it will pull you into one of the last remaining mysteries and one of the last real treasure hunts of this world! It will also include many as-of-yet unpublished pictures of all the sites described! The Holy Grail, Adolf Hitler, Jesus, Isis, Maria Magdalena, Dan Brown’s “Da Vinci Code”, Bérenger Saunièr, the Knights Templar…. they all have ties to this place – and that is just the footnote! Stay tuned for the official cover picture and the precise publishing date. Why online, interactive, text-based role-playing is the best hobby for writers/authors! some of you might think, that online interactive, text-based role-playing is something for nerdy kids. Maybe it was ten years ago. Today it is an art form of writing and it can be highly enjoyable and a very good training for professional writers! Let me first explain what it is, for those of us who haven’t spent most of their lives online. Online role-playing is available for many different fantasy worlds, which are mostly based on famous TV shows or movies. As an example I will take one that is based on Star Trek, an epic TV show that 99% of all people have seen at one point in their lives. Anybody can join this text-based role-playing game. The first thing you do is to create a character (sound familiar?). The only condition is that the character traits fit into the Star Trek Universe, so you could make a Vulcan character, but not an Ewok, because that’s from the Star Wars Universe. You will then be placed as a crew member on a starship (one coherent role-playing unit within the game), with the entry rank of “Ensign”. On this ship, you have all the other characters too (Captain, First Officer, Chief Medical Officer, Chief Engineer and so on) and each of them is played by another member of the RPG (RolePlayingGame) community. Each ship (or role-playing area) has a Gamemaster. He or she guides the the ship and its crew through a specific mission (the equivalent of one TV episode). If you participate in this game on a regular basis and write well, your character will advance in rank. Once you are a Captain, you can get your own ship and you can choose your own crew. But for writers, the job of a Gamemaster is much more alluring. Think about it! You constantly get to create new characters if you wish to interact with the crew during a mission – very good training! Planning an episode for the crew of your ship is almost like planning a book. Running an interactive episode is even more challenging, because you have to stay very flexible and react on the reactions of your crew. The job of a GM is not to shine him-/herself, but to write a great story that challenges each player to respond with more depth, feeling and quality that make them shine! You are the equivalent of an entertainer running a show on TV, only what you do is much more demanding. You will have to train your skill to improvise and re-write your story-arc as it develops. At the same time, this is a very creative and inspirational process, because the inspiration goes both ways. You will find that the reactions of your players inspire you and make you do things in writing that you have never even thought of before! The same happens when you play a character of course, but as a Gamemaster it is happening on a much larger scale. I can not stress enough how much you can learn by writing interactively! You learn new ways to use language. Those games have players from all over the world. American, English, Irish, Canadian, Australian and even non-native English speakers whose English is good enough to participate. They will teach you expressions you have never even heard and enrich your vocabulary greatly. You gain like-minded friends. Yes, it is possible, even on the web. If you have interactively written with some people for a long time, you get to know them very well. Besides, most of those online RPGs have their own community sites, where people meet up to chat. It is easy to become part of them, because everybody knows one trait you all share: In this case the love for Star Trek. In short – it is the perfect hobby & enjoyable training for writers! You get to immerse yourself into an alternate world that you like/love, you get to create deep, believable characters, you get to train your spontaneous writing skill and you learn a lot from those who interact with you in writing. Contrary to common belief, you do not need to be online at the same time, nor do you interact via email. This wouldn’t work for a community who has a large number of members all over the world. Interactive, text-based writing has changed my life, by giving me the courage to go public with my writing and get published! I have learned a lot through it and I have made real friends in six different countries, two of which I have already met in person. After a long day of writing for my next novel, I am still looking forward to go online and interact with my characters in my RPG. It is a different kind of writing and I feel it to be very relaxing and fun. At the same time, it can become incredibly intense and deep, because you know the other character is not just another part of your own mind, but a real person. Some of the threads I have participated in or read truly reach the “Tolkien level”. I have been a Gamemaster in my RPG for many years now, but I’ve just recently read my first book for authors and their “tools of the trade”, the “How to..”. It read like a description of what I have been doing in all those years as GM! But then of course I had to train to become a GM too. I did a course and the exam. All this is offered at no charge by my RPG. If you would like to know more about this great hobby, feel free to comment on this post.